This is a pre-Civil War building. The faithful worshiped in this beautiful church before President Lincoln issued the Emancipation Proclaimation. Henry Porter Baldwin was born in Rhode Island in 1814 but migrated to Detroit. He became a prosperous merchant shortly after Michigan joined the Union and long before Detroit developed into an industrial metropolis. Similar to many businessmen of his era, he got active in politics. He participated in the Michigan Republican Party and was elected to represent Detroit in the Michigan Senate for the 1861-1862 term. He was elected governor and served in the Reconstruction era from 1869 to 1872. He was appointed to represent Michigan in the United States Senate from 1879 to 1881. St. John's parish was founded in 1858. 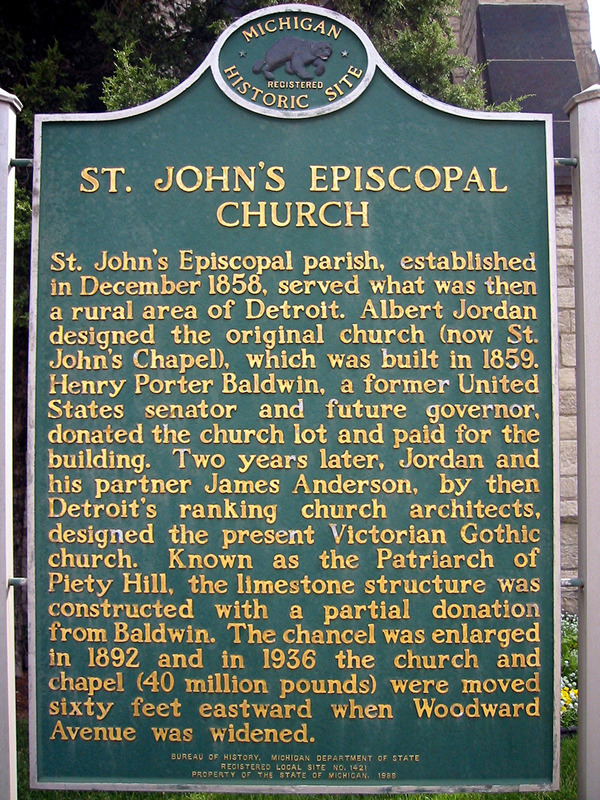 This was, I believe, the second Episcopalian church to be founded in Detroit. St. Paul—now the Cathederal Church at Woodward and Warren—was the first. Baldwin was secure enough to purchase this land that was then farmland just northwest of Grand Circus Park in the city that Judge Woodward laid out. At first a small chapel was costructed on this property and it opened in 1858 but it soon prov ed too small. Albert Jordan was selected as the architect. He and his brother, Octavius, were architects in Hartford, but migrated to the growing city of Detroit in the early 1850s. Albert Jordan quickly became the city leading architect for churches. For St. John's, Jordan designed a Victorian Gothic style church entirely consistent with the Episcopalian expectations of that time; that is, a magnificent Episcopalian church should resemble some of the great churches of England. Jordan built the church with Kelly Island limestone added sandstone trim and then augmented his building with flamboyant stone tracery. This church was completed in 1861, but was moved 60 feet to the east when Woodward was widened 74 years later. The steeple was disassembled and then rebuilt. Writ Rowland who designed the Guardian, Buhl and Penobscot skyscapers, made numerous changes in this church when Woodward was widened. Albert Jordan's other great achievement of this era is the Fort Street Presbyterian Church. There are many historically significant aspects to this church. The original 1858 chapel survives although it has been rebuilt and moved twice. Some of the stained glass windows date from 1865 but there are new ones including at least three from the Tiffany studios in the late Nineteenth Century. An organ was first installed in 1901 but it has been rebuilt three times. If you walk around this church, please observe the architectural detail. You will see gargoyles designed by Detroit sculptor Walter Schweikart. Then think about the different stages of the city's long history: this church was completed at the time the Confederates fired on Fort Sumter to defend slavery, the Fox Theater across Woodward representing the greatness and prosperity of Detroit in the 1920s, the Fisher Freeway from the 1960s, and then Comerica Park opened in the fourth month of the 21st century. 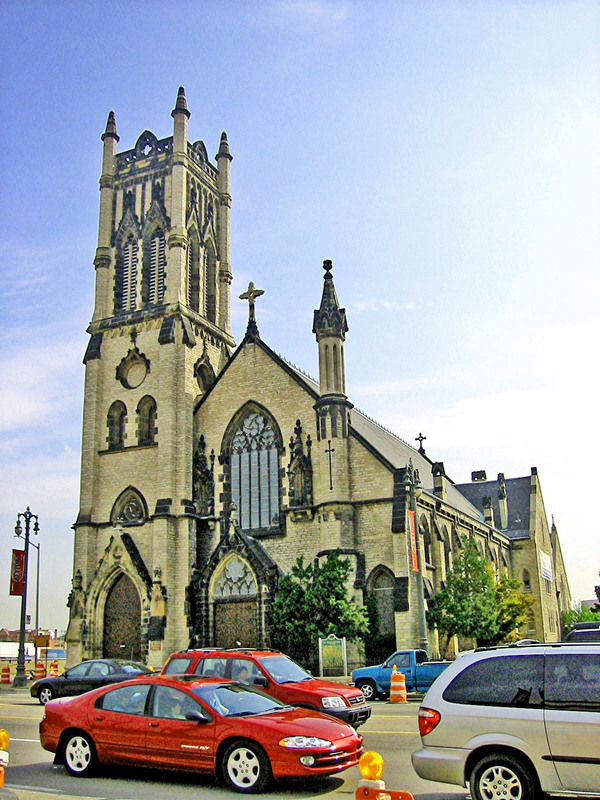 St. John's is the oldest church in Detroit's Piety Row. After St. John's located here, Detroit main street - Woodward - became the most prestigeous location for a church or synagogue. As denominations became financially secure, they erected architecturally significant structure on Woodward demonstating to Detroit their importance. Eventually 21 church and two synagogues were built along Detroit's Piety Row that now stretches from Grand Circus Park to Highland Park. Very impressive pictures of this church and its stained glass windows are presented in the 2012 book cited below.